Slotastic is one of the first online casinos to offer the new Panda Magic slot from Realtime Gaming. 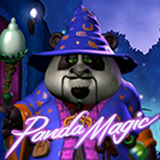 RTG's new Panda Magic slot is a spellbinding game with a free spins feature where all payouts are doubled. And speaking of doubled... Until the end of the month, Slotastic will double your deposits (up to $777) and throw in 50 free spins on the new game! Valid until August 31, 2016 only. 100% casino bonus available through August includes 50 free spins. In this fantastical new online slot game, a mystical Panda is a powerful wizard bearing charms, spells and potions. The Panda is the Wild and when it appears it can magically expand to cover its entire reel. During free games he can wave his want to initiate the More Magic feature, adding up to 3 extra Wilds to each reel. Three or more scattered Magic Tickets triggers up to 30 free games where all wins are doubled. During free spins, the Magic Panda can activate the More Magic Feature, adding up to 3 Wilds or even expanding wilds. Panda Magic is an “All Ways Pay” game so there are 1024 possible winning combinations on each spin. Try Panda Magic on your desktop or laptop computer in either the downloaded or instant play casinos or on your iPhone, iPad or Android smartphone or tablet in the mobile casino.